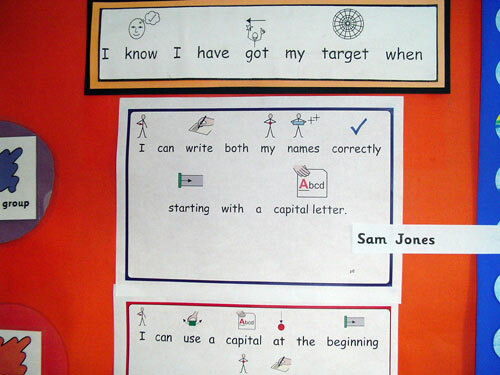 Symbolising targets for pupils who find it difficult to remember what they are working on, and what is expected, can be a very successful way of getting them to achieve. 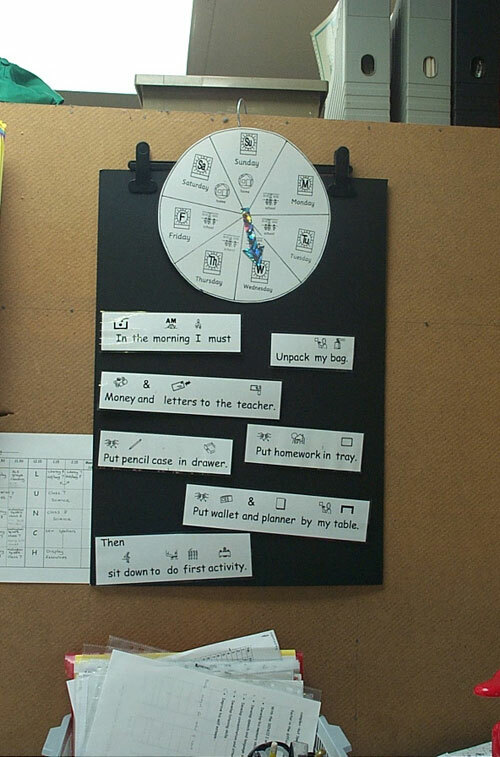 The photos show a symbolised 'wheel' showing days of the week with an arrow for 'today's day'. Beside it are symbols to act as visual reminders about expected behaviour; good sitting, good looking, and putting your hand up if you want to say something rather than shouting out. The other photo illustrates targets for taking off clothes ready for PE. 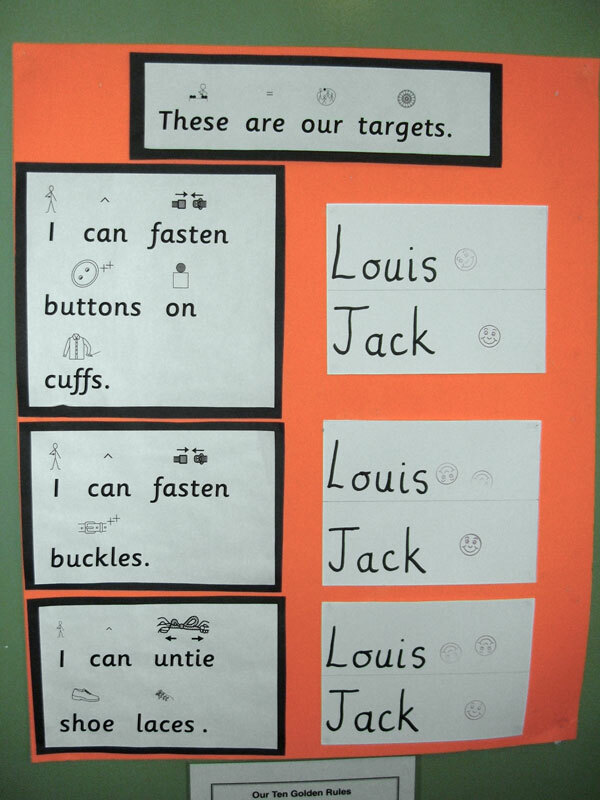 Pupils get a sticker each time they achieve the target. 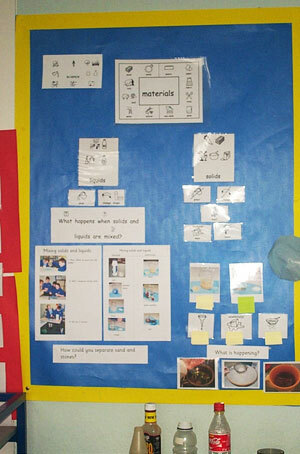 An Interactive display on Solids and Liquids - The pupils were learning about different sorts of materials and the teacher created this very interactive display of the key ideas she had been teaching. It shows the combination of symbols, photographs and real 'objects' (bottles on the table). Pupils were able to return to this display and talk about what they had been learning. They were reminded by the visual nature of the display, and could see photos of themselves doing an investigation. They all had a real sense of achievement after this topic work. The pupils all had a Science vocabulary book with symbols and photos as visual reminders. They wrote definitions of the key vocabulary and stuck in photos showing evidence from their own investigations. 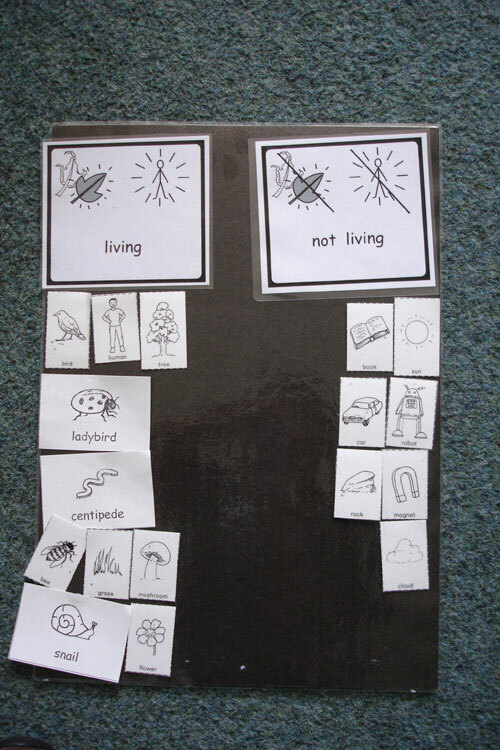 This shows a sorting activity of things that are living or not living, with all the words symbolised. 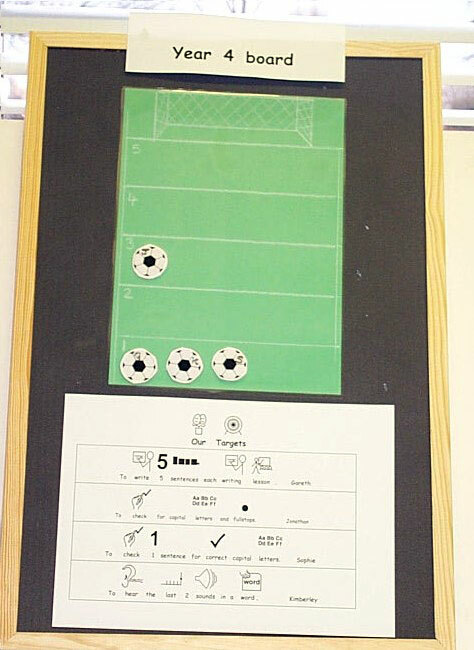 This enabled a pupil to complete the activity independently. 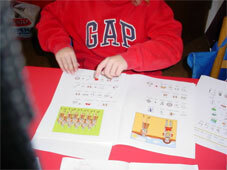 The activity reinforced key vocabulary as well as giving the pupil a real sense of achievement. 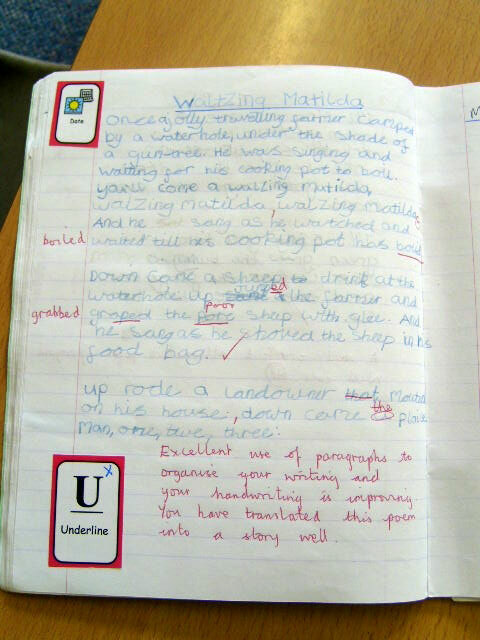 A Teacher has marked work using symbols as well as written comments. 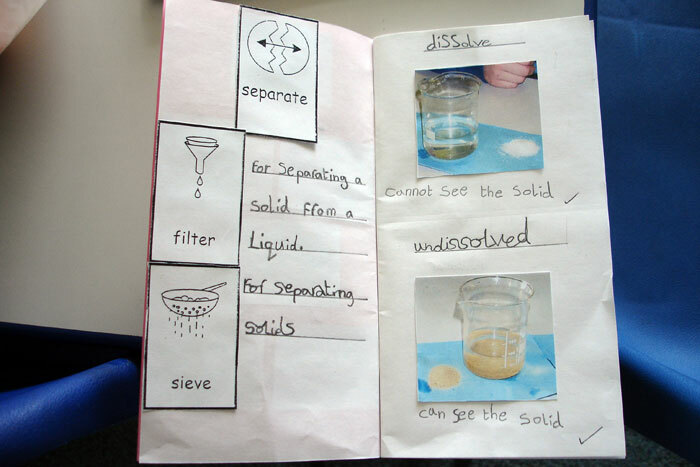 Symbols for 'date' and 'underline' are stuck on the appropriate place in the pupils book to explain what has been missed. Marking work and giving feedback in this way helps pupils to understand 'next steps' and reward achievement. 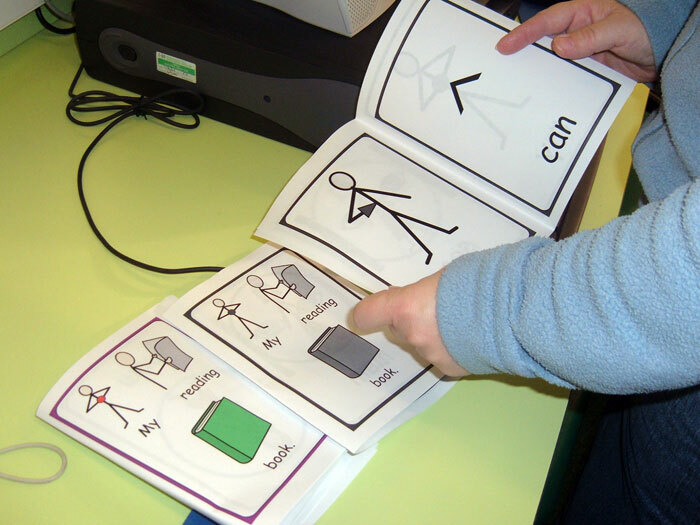 The right hand picture shows the colour coded marking system with symbol supported explanation. Again this helps pupils to understand how achievement is rewarded. The photos show use of smiley faces to reward 'doing the right thing' and symbolised targets for literacy. 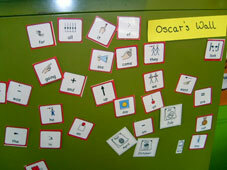 All these strategies help to support independence and improve self-confidence. 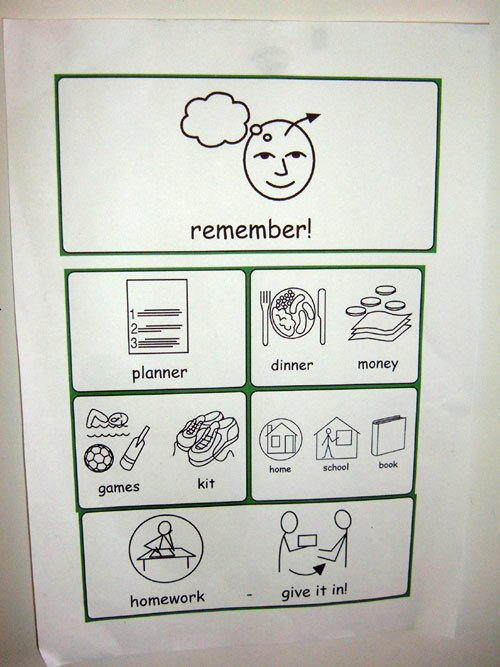 The left hand photo shows a reminder of what pupils need to remember to bring with them to school each day. This was displayed in class and by the coat pegs. 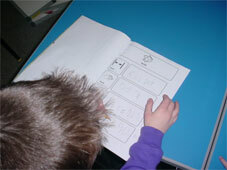 A copy was also sent home so parents were reinforcing the information. 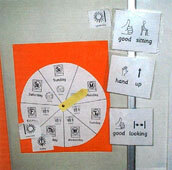 The left hand photo shows a day wheel and then lists what the pupil needs to do on arriving at school in the morning. It includes such things as putting lunchbox on the trolley, handing in homework and giving the teacher a home-school book. 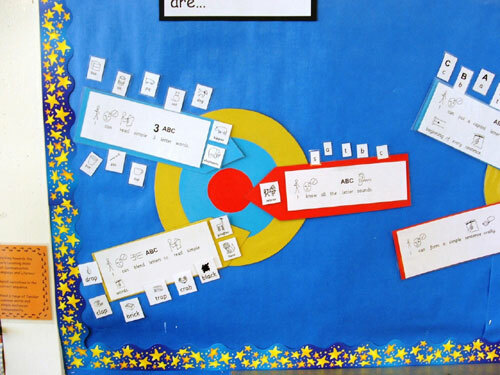 This Target Board for a Year 4 group was used in Literacy. 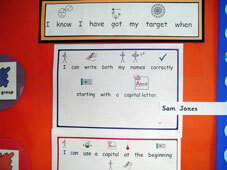 The targets were put at the bottom in symbolised text at the start of each lesson. Each pupil had a 'football' which they moved at the end of the session according to how well they had achieved the target. This was done in discussion with the group and the adult present. The group was all boys and they found this very motivating as they all had a keen interest in football. 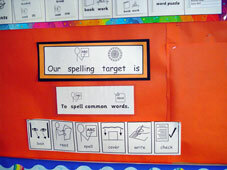 A group spelling target clearly shown with the strategy for practice - look, read, spell, cover, write, check. This clearly reminds pupils what to do, helping independence in the classroom. 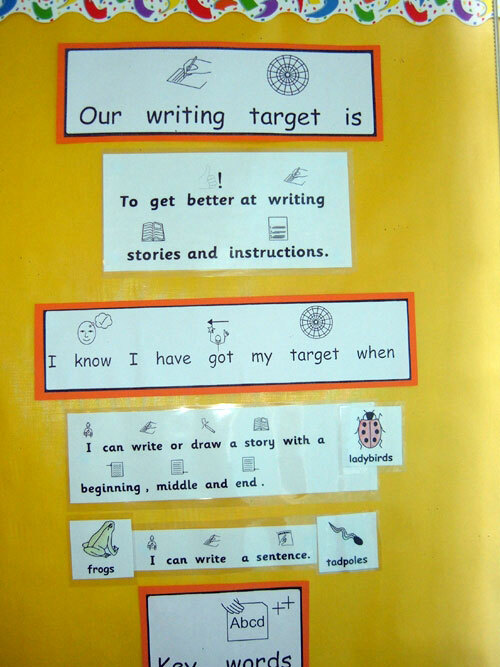 This target board is from a Year 1 classroom. 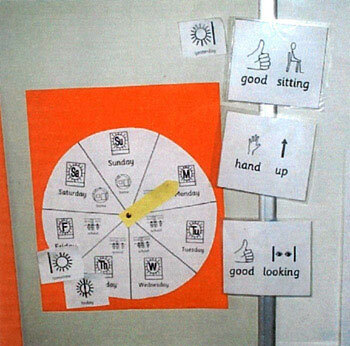 It show Literacy targets with symbols as visual support. Each group knows which target to focus on because their group picture is put next to it. eg 'Ladybirds' need to try to write or draw a story with a beginning middle and end. 'Frogs' and 'tadpoles' need to write a sentence. Knowing what is expected often makes pupils happier about learning. 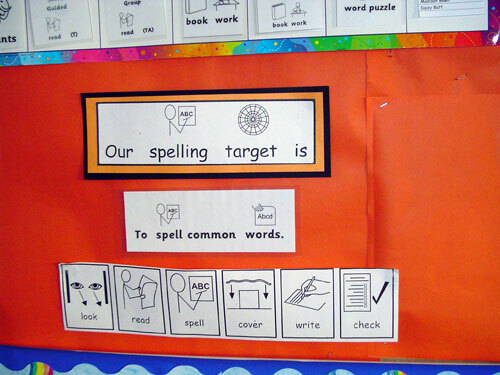 This target board is from a Reception Class. It has the various class groups put next to targets that have been achieved. In this case 'zebras' know all their letter sounds and 'giraffes' and 'lions' can blend letter sounds to read simple words. This is a really visual way to demonstrate what has already been achieved. 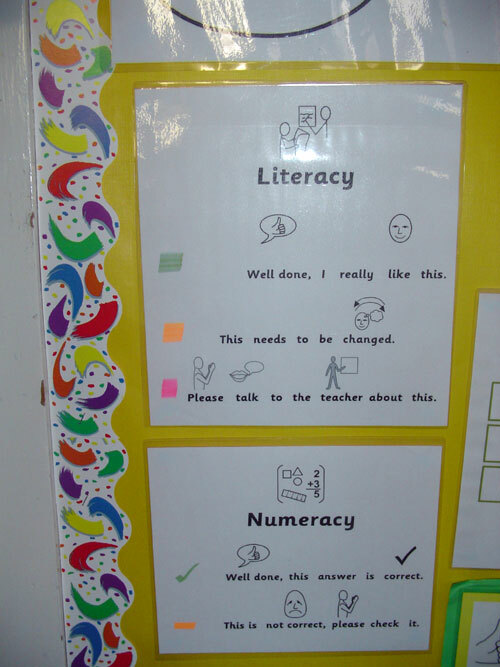 Symbolised key words on a board for a pupil who struggles with remembering vocabulary and spelling the words. It encourages independent resourcing and helps Oscar to think about what he wants to write. He can come and get the words he needs from his word wall and take them back to where he is working. These symbolised communication cards on a ring enable a pupil to take them out to play at breaktime or lunchtime play. This helps him to explain to adults what has happened or how he is feeling. Again it enables him to be more independent and increases confidence. "I support a young lady in Yr 6 at a school in Warwick who has severe learning difficulties. At her last review in April she could not read any words except her first name. I had suggested for some time that they use CIP symbols to support her. The new TA took this on board! Last week at her Year 6 annual review, the student was able to read her own responses to the pupil questions with very little prompting. 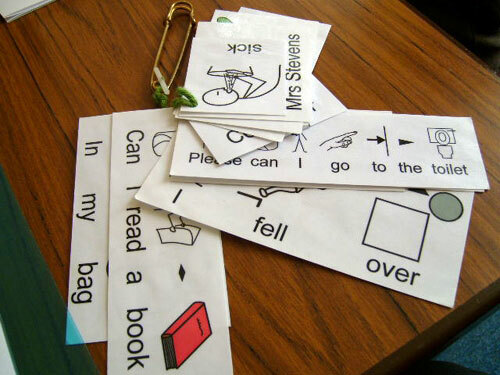 She now enjoys reading and is remembering the words/symbols from day to day, which was always the difficulty behind her lack of developing a sight vocabulary. The parents were amazed and I was nearly in tears! "